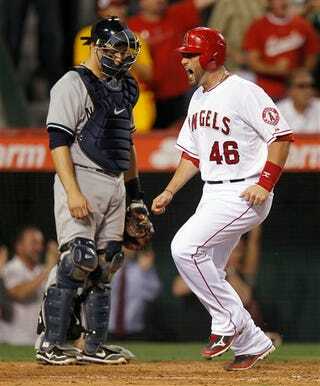 Today's petty tyrant is Laz Diaz, who worked home plate during last night's Yankees-Angels game in Anaheim. Diaz exchanged words with Yankee catcher Russell Martin over balls and strikes, which is a no-no on Martin's part. But according to Martin, Diaz responded in a unique and passive-aggressive way: he refused to let Martin throw the ball back to his pitcher when a new ball was put into play. "Laz actually, hurt my feelings," Martin said. "The umpire wouldn't let me throw the ball back to the pitcher. That's never happened to me before. That's a good story, right? "He told me I had to earn the privilege. Even at the end of the game after I get hit in the neck. I'm like, can I throw the ball back now? He's still like no. I'm like, you're such a (expletive). Like for real. Unbelievable. I even told him like when there's guys on base, I like to keep my arm loose. No. I'm not letting you throw a ball back. That's pretty strange to me." Martin surmised that Diaz was goading him into getting ejected, even though our own little Laz Diaz profile shows he's not particularly prone to giving players the boot. But the last time we had a Laz Diaz blowup around these parts (less than two weeks ago), it was good evidence for instant replay. This one doesn't help that argument, since all the robot cameras in the world won't help restock inventory at the jerk store.